Just think of all the money you'll save. Coffee shops offer a lot of special drinks that give us little reason to brew our own coffee at home. They serve our lattes with fancy art. They pour chocolate syrup on top of our mochas. They even add fun flavors to our regular cup of joe. It's great, but there's something you should know: you can make all of these things at home, easily -- and save some real money, too. The fancy syrups that spruce up your morning coffee are nothing more than flavored simple syrup. (Simple syrup is just sugar that's been dissolved into water, typically in a one-to-one ratio.) 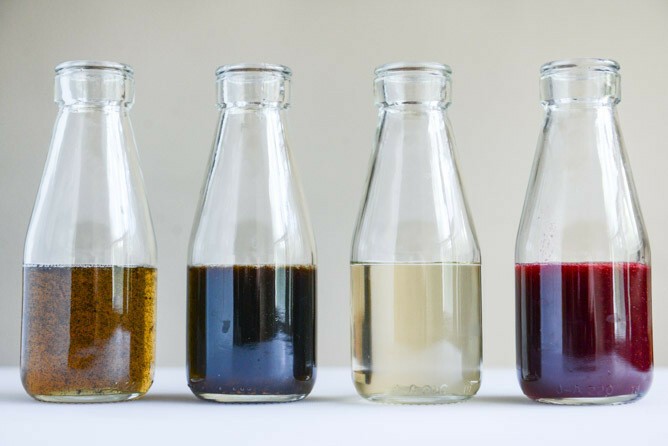 These syrups can easily be flavored with just about anything you dream of. Mint? Yes. Hazelnut? But of course. Pumpkin spice? Definitely. You get the idea. You can take this concept and run with it. To get you started on your homemade coffee syrup adventure, we have great instructions and recipes for you thanks to the lovely Jessica of How Sweet It Is. She has guided us through four coffee syrups (pictured above) over on her blog. Get the recipes here and experience coffee magic in the comfort of your own home.